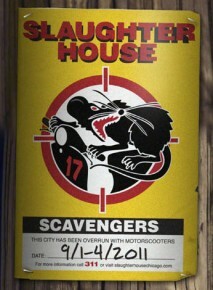 We should share a few things to help you plan before the full Scavengerhouse rules/list are published Thursday: Teams can be 1-6 members, so plan your team ahead of time. Each team will need a captain, a cell phone contact number, and a digital camera. Wireless internet access and a GPS will REALLY help. The list contains about 100 items of varying difficulty, including photo clues, items to collect, a math ‘word problem,’ performance art, and some time/location-sensitive clues including two big-point ‘secret missions’ that will be revealed over the course of Saturday. Also, if you’re not interested in the scavenger hunt, fear not, we’ll keep you busy.